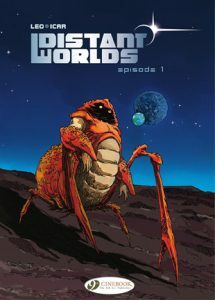 Here’s something new from Europe, published by Cinebook: Distant Worlds is a full-color science fiction graphic novel series created by a team known and Leo and Icar. “18-year-old Paul, his mother, and his sister land on Altair-4, a recently established human colony. They expect to be reunited with Paul’s father there and start a new life, but he doesn’t show up to welcome them at the spaceport… Later, they are rescued from a gang of thugs by a Stepanerk, a member of a sentient alien species. It’s an encounter that will prove invaluable to Paul when he decides to go and look for his father.” Check it out (three volumes so far) over at Comixology.